The new 2019 Trooper was bred to dominate. It really does have it all. It’s big. It’s got all the comforts of home. And it’ll take you anywhere you want to go. But there’s a few more reasons why the Trooper is great. The Trooper’s new BF Goodrich All-terrain tyres are the toughest tyres ever made. These tyres deliver exceptional durability and traction for traversing harsh conditions so you can have the confidence to take on the most difficult challenges while touring. If you’re game, the Trooper is packed with enough power to keep you living off the grid for a long while. Compared to a 115Ah AGM battery, the Trooper’s Redarc Lithium battery system is more than 70% lighter while putting out three times the power. 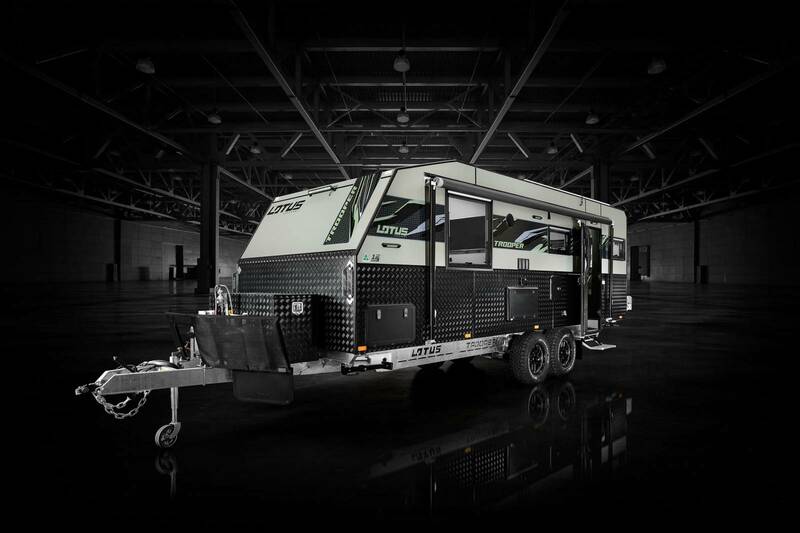 Combined with the 680W of solar power, you have enough to enjoy all the comforts of home, unplugged from the rest of the world, for extended trips off-grid. There are plenty more reasons to love the 2019 Trooper, see the specs here or start building your own.